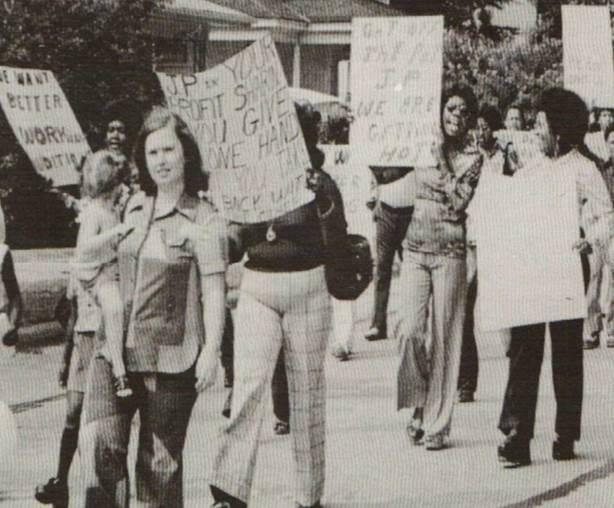 In the 1970s, the small town of Roanoke Rapids, North Carolina was dominated by the J.P. Stevens textile mills, which controlled many aspects of its workers' lives. A coalition made up of workers from different races, genders and religious backgrounds came together and won the right to a union. Host Frank Stasio talks about their historic unionization efforts with Joey Fink, a PhD. candidate in History at the University of North Carolina at Chapel Hill. Jeff Tiberii: In between the railroad tracks and the Mayo River rests a once vibrant building. The windows of this former Washington Mills factory have long since been bricked up and no one has worked inside for 13 years. On the back side of the building is a gaping hole, and on this cool winter afternoon, workers are dismantling what has become a symbolic eyesore. Bill Morehead: It was the backbone of the community, while it was running. It kept people working; they made a living, a good living. For decades, the textile industry was an essential part of North Carolina’ economy. But the industry took a huge hit in the early 2000s due to outsourcing and high rates of automation.